When you walk into any workout facility, chances are you’ll see an elliptical and a treadmill. These machines both provide a great aerobic workout, but each one has its own pros and cons. Which one is going to help you lose the most weight? What burns more calories: elliptical or treadmill? Today we’ll take a look at what each machine does and which one will help you shed the most fat. Treadmills are one of the most easy to use workout machines you’ll find in any gym. They are versatile and can be used for running, walking or sprinting. The surface is smoother and more predictable than a sidewalk, making it ideal for seniors or individuals with joint problems. They are easy to use for a variety of workouts by adjusting the speed, incline, warm up period, and cool down period. Most treadmills come equipped with sensors that allow you to monitor your heartrate. You can also see how many calories you’ve burned. 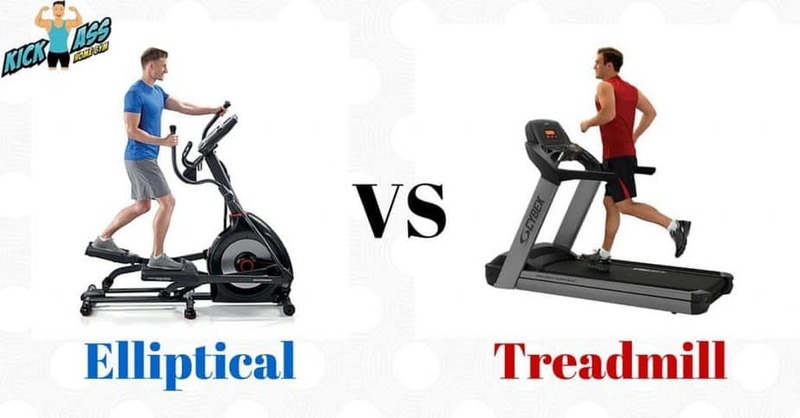 As opposed to elliptical machines, treadmills have been around since the 1800s and are very well researched. Walking and running on a treadmill can strengthen your joints and bones. One of the main drawbacks to treadmills as opposed to elliptical machines is the stress they cause on your joints. Treadmills vary greatly in their ability to absorb the shock of each step. You can find a great comparison of different treadmills’ cushioning systems by clicking here. Treadmills can also be can also cause people to alter the way they walk or run. The size of the belt and use of handles that monitor your heartrate can cause you to move your body in an unnatural way. This can cause muscle, joint, or posture problems. The most obvious benefit of the elliptical is that it eliminates the impact of running or walking on a treadmill. This means you are much less likely to damage your joints on an elliptical. Most elliptical machines come equipped with moving handles. These allow you to work your upper body as well as your lower body. In fact, a study by Eastern Washington University found that most people’s perceived exertion on an elliptical machine is lower than their actual exertion. This means that you’re getting more of a workout on an elliptical than you realize. Additionally, most elliptical machines allow you to go backwards. This works your calves and hamstrings more than a treadmill can. Elliptical machines offer fewer settings for the user to adjust than a treadmill. Typically, the only setting the user can change is the resistance. Additionally, elliptical machines don’t strengthen your joints the same way a treadmill does. What burns more calories? Treadmill or elliptical? When it comes to burning calories, the results are pretty close. The treadmill burns slightly more calories than the elliptical, but those few extra calories come with a lot more exertion. The treadmill’s slight advantage comes from the way it’s used. Because you must lift your body off the deck, you expend more energy with each step. It’s also important to note that the calorie counter on the elliptical is the least accurate of all the workout machines. This is because it’s easy to use the machine’s momentum to keep it going. A good rule of thumb regarding the elliptical is if you feel like you’re not burning calories, you’re probably not. Is elliptical better than treadmill? So which machine is better for weight loss: the elliptical or the treadmill? It depends. While you’re burning a few more calories on the treadmill than the elliptical, the difference is really negligible. Some people prefer the treadmill because they’re able to feel the workout more than they can on an elliptical. A treadmill is probably a better machine to prepare you for a long run. The elliptical never hurts my joints. I love being able to incorporate my upper body using the handles. There’s typically less competition for an elliptical machine in the gym. I enjoy pedaling backwards to work an entirely different group of muscles than I can on a treadmill. Whichever machine you prefer, always remember that you get your best results when you vary your workouts. If you’re interested in adding either of these pieces of equipment to your home gym, be sure to get a quality unit to avoid injuries. If you have any questions, be sure to leave them in the comments section below.